If you need to locate your John Deere model number and product identification number (serial number), we can help! Find your John Deere equipment below to see model number and product ID number locations. Jacks Small Engines is not an authorized John Deere parts dealer. However, we do carry aftermarket parts for your John Deere mowers and equipment. The model serial number of a John Deere riding mower is printed on an identification tag located below the operator's seat or on the back of the lower frame between the rear wheels. The serial number (PIN) is 13 or 17 digits long. Find your John Deere - Aftermarket riding mower parts. The model serial number of a John Deere lawn mower is printed on an identification tag located on the left side of the deck (standing behind the mower). The serial number (PIN) is 13 or 17 digits long. Find your John Deere - Aftermarket lawn mower parts. 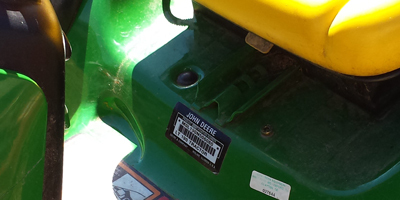 The model serial number of a John Deere zero turn is printed on an ID tag located under the seat. You must lift the seat up to view the ID tag. The serial number (PIN) is 13 or 17 digits long. Find your John Deere - Aftermarket zero turn parts.